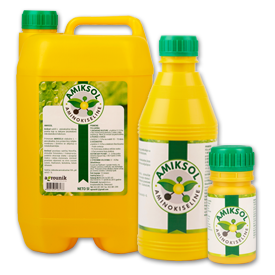 Amiksol is a liquid fertilizer with amino acids, certified for application in organic and traditional agricultural production. Amiksol contains L-amino acids of vegetable origin, which are obtained by (enzymatic) by microbiological hydrolysis. Amiksol contains 16% of free aminokiselina. By the hydrolysis of materials of plant origin, using enzymes of bacteria obtained free L amino acids which are biologically active and have a very important role in the metabolism of plants. Plants synthesize from own sources all of 20 amino acids but in some groups of plants one or more of them are produced in insufficient quantities. Proteins have a limited lifetime and must be constantly translated from RNA to ensure normal growth and development of plants and undisturbed all physiological functions. This means that the plant must have supplies for all 20 amino acids that would synthesized proteins and lead to normal growth and development. Some grains have a deficiency of essential amino acids, primarily lysine, threonine, histidine and tryptophan. Legumes from the other hand have a deficiency of amino acid methionine. AMIKSOL contains all necessary and often deficient amino acids which for some plants can be a limiting factor for normal or optimal development. Protein biosynthesis, because they are the precursors for protein synthesis. They also posses acidic and basic groups which behave as buffering agents, maintaining the pH of the cell. They are also the nitrogen sources for the plants in the form more accessible rather than inorganic nitrogen. Resistance to abiotic stress (such as high temperatures, low moisture, frosts, parasite attacks, hail, flooding, disease or phytotoxic effects). The application of amino acids before, during and after stressful conditions provides plants with amino acids that are directly related to alleviating some of the growth inhibitory effects of physiological stress. Photosynthesis Amino acids play a crucial role in the development of vegetative tissue and chlorophyll synthesis. A higher concentration of chlorophyll means a more intensive process of photosynthetic metabolites. The high level of photosynthesis provides faster and stronger plant growth, as the increased concentration of chlorophyll means more robust vital functioning on a cellular level. Stomata are cellular structures that control a plant's internal hydro balance, as well as the absorption of gases and macro and micro nutrients. Stoma's openings are controlled by external factors (light, moisture, temperature and concentration of salts), and by internal factors (amino acid concentration, abscisic acid, potassium pump etc).Stomata are closed when light and moisture are low, and temperature and salt concentration are high. When stomata close, photosynthesis and transpiration (low macro and micro nutrient absorption) are reduced, effecting respiration negatively. When this occurs, a plant's metabolic balance is negative. This causes metabolism to decrease and plant growth to slow or stop. Polination and fruit set. These amino acids increase pollen viability, germination and the length of the pollen tube. Phytohormone Amino acids are the precursors or activators of phytohormones L-Methionine is a precursor of ethylene and other growth factors such as spermine and spermidine, L-tryptophan is a precursor of auxin. L-Arginin influence flower development and hormones connected to fruit development. L-Alanin, L-Valin, L-Leucin increase the quality of fruits, L-Histidin assists in the appropriate fruit maturation and flower essential oils and resins. When the plant is in a state of stress due to high or low temperatures, inadequate water regime, nutrient disorders, damage from hail, pests, and disease, synthesis of amino acids and proteins is reduced. With use of AMIKSOL, free L-amino acids which are directly involved in protein synthesis rapidly pass through the cell membrane and help the plant to recover quickly. They promote plant fecundancy, and can positively influence flowering and/or fruit set. 1. FIELD CROPS CULTURE in the amount of 2-3 l/ha in intensive growth phase 2 times during the growing season. It can be mixed with pesticides. 2. VEGETABLES AND FLOWERS in the amount of 1-2 l/ha every 10-15 days. 3. DRIP SYSTEM: 2 -3 l / ha over drop by drop, 3 to 4 times during the growing season. Increases protein synthesis and increases the content of chlorophyll. It stimulates photosynthesis and transpiration. It encourages the opening of stomata in plants and adoption of macro and micro elements. It increases resistance to stress caused by drought, cold, disease, malnutrition.